Keeping up with Landree: Who says boy clothes can't be cute? And Thanks! Who says boy clothes can't be cute? And Thanks! 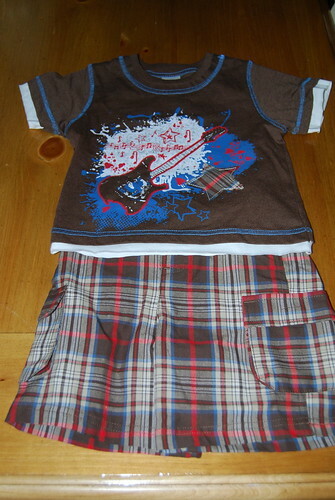 I love this super cute outfit my friend Maranda sent to Hudson. It's a 12 month-won't my little guy be super cute running around in this? There was even a matching hat. Thanks so much Maranda! And speaking of clothes, my friend, Megan has outfitted us in just about everything we own that's a newborn size. Her little man is just a few months older that Hudson. It has saved us a lot of money! It's a good thing we have a boy-somehow I can contain the urge to shop for him so much easier than for Landree. Thanks so much for sharing with us Aunt Megan! We've been so blessed by all of our friends and church family that have been providing meals for us to make our transition as smooth as possible. I haven't cooked since I've had Hudson, thanks to my mom while she was here, and then since the day she left we've had meals from church family and friends every day or two. And they will continue until Jeff's mom comes the beginning of October. We can't say thank you enough! ohhhh how I loved the meals!!! I JUST started cooking again as of last week... 7 weeks of no cooking really spoiled me:) Enjoy it while you can! How sweet of Aunt Megan! My brother had a little boy last summer and they sent us all of his outgrown clothes, too! Such a money saver! 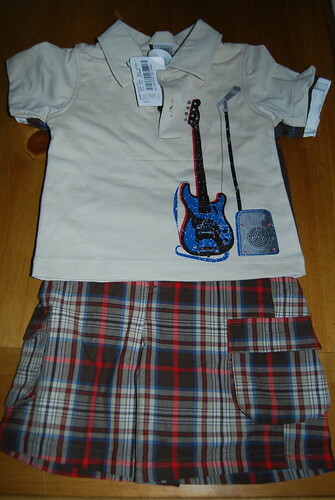 Boys clothes are awesome ...they've come a long way. Congratus on your new bundle of joy. Hudson is simply adorable!! I am so glad people are bringing you meals. I would bring you a meal if I lived there:0) CUTE clothes. Cute outfits! Enjoy all of your yummy meals! Baby Hudson will be getting something from Etsy! I couldn't find a thing at the mall this weekend!